With Great Power comes Great Responsibility.. likewise.. With Ubisoft comes Season Pass..
Six new Heroes – These will be released in batches of two at the beginning of each new season of the Faction War. Season Pass owners will have access to these Heroes seven days before they are available to all players. After the Season Pass early access period, these Heroes can be unlocked with Steel, For Honor’s in-game currency that can be earned by completing matches and in-game challenges. 30-Day Champion Status – Gives XP boosts to you and your friends, as well as more XP from crafting and more loot at the end of matches. 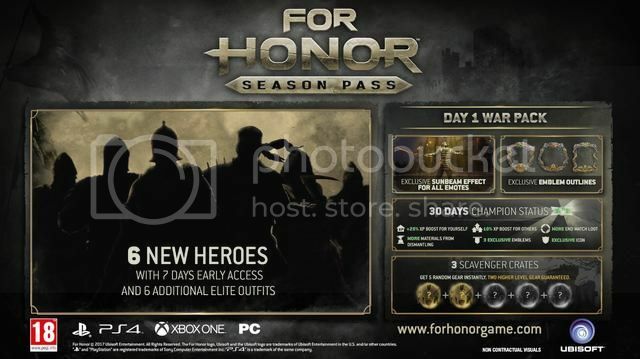 In addition to the Season Pass content, For Honor will feature free downloadable content that will be released over the course of the three seasons. This content includes new maps, modes, and gear that will be available to all players, but Season Pass owners will have an early access period for some elements of this content as well. To be honest, The Season Pass only seems to have Exclusive Cosmetic items. The Scavenger Crates & 30-Day Champion Status feel a bit like pay-to-win stuff as it gives an early advantage over others. The new heroes, maps and modes & gear are all early-access only. So it feels like Season Pass holders aren't really paying for any real extra content. That said, it is good that the new heroes & extra playable content will be made available to everyone. So that the online community won't get split over the different modes and maps. Definitely some factors to consider before throwing the extra cash for the Season Pass..